Editor’s note: It has come to our attention that the turtles we had originally referenced are actually spur-thighed tortoises. We have made the appropriate changes to portray accuracy. We regret the error. Tortoises’ best protection against predators is that they can hide in their shells. This makes them easy to ship around the world, as they tend to get tossed into sacks and boxes like mere rocks. Statistics derived from the Italian and French cities of Genoa and Marseille—apparently favored destinations in an illegal trade from the nation of Tunisia—indicate the confiscation of approximately 1,500 live tortoises from Tunisian smugglers each year. The numbers could be precipitously higher, given there are many shipments that go undetected. The bulk of these tortoise-smuggling operations take place during the late summer, when Tunisians return to Europe from their homeland holidays after collecting these reptiles. Primarily a desert climate, the African country of Tunisia is not particularly rich in renowned exotic wildlife, but due to its dire economic circumstances – the case in many other nations prone to notoriously heinous animal-smuggling operations – Tunisia’s wild tortoises and striking birds of prey suffer the consequences. 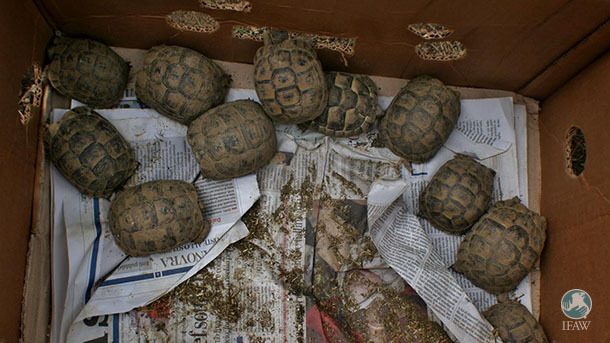 Wild tortoises can fetch a high price in Europe, so they are often stuffed inside cardboard boxes where they are layered upon several inserts of cardboard “flooring.” Boxes are stacked on board ferries departing from Tunisian ports. In the case of birds, flight feathers are trimmed so that they will not flap about, and they too are lain down and placed in cartons. As camouflage, these cartons are covered with a layer of commonly carried vegetables like tomatoes, peppers or onions. Lax inspection in many Tunisian ports results in many animals undertaking this precarious journey across the Mediterranean. Predictably and unfortunately, many birds and tortoises die along the way. Fortunately, there are also many who humanely and boldly stand up for these voiceless creatures. Rescued birds are returned to Tunisia, where they remain in the care of a local NGO for rehabilitation and until their feathers grow to a point when they can fly and be released back into the wild. As for wild tortoises, they are all brought to a rehabilitation center located 30 kilometers south of the capital Tunis, called Boukornine National Park. The Tunisian Public Forest Management established the park in cooperation with Marwell Wildlife. The center features a one-hectare corral, a modest lab and a small hospital supervised by a veterinary surgeon from Marwell Wildlife. Four veterinarians, all graduates of the National School of Veterinary Medicine in Sidi Thabet in Tunisia, staff the center. 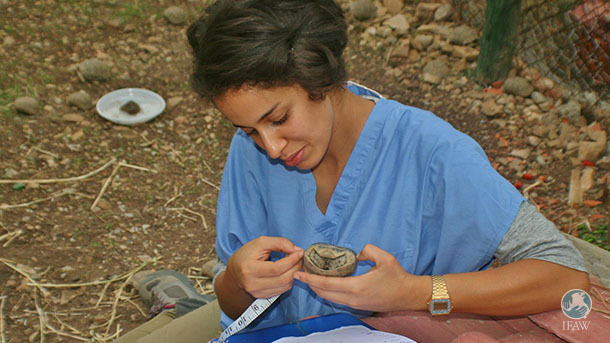 The center is renowned for its research related to indigenous tortoise species. Such rehabilitation operations are not without great expense. To help meet these costs, French and Italian authorities cover the cost of returning the smuggled wild animals to their native land. However, other European countries like Belgium, for example, require the Public Forest Management of Tunisia to shoulder these expenses. Considering Tunisia’s weaker economy, however, this expense becomes difficult to bear. Because the limited wildlife in Tunisia is so highly valued, the government has expanded its nation’s network of nature preserves from 7,400 hectares in 1987 to 600,000 hectares in 2011. Tunisia has become a signatory to several international conventions, such as the Convention on International Trade in Endangered Species of Wild Fauna and Flora (CITES) and the Convention on the Conservation of Migratory Species of Wild Animals (CMS). In 2006, the Tunisian Minister of Agriculture and Water Resources established a list of rare and endangered plants and animals that society is charged with protecting.